The PSA market in Asia-Pacific was estimated at USD 3,991.5 million in 2017. The market is anticipated to register significant growth over 2018 to 2023 (the forecast period), at a CAGR of 7.52%. The tape segment was observed to be the largest application segment in the Asia-Pacific PSA market, which accounted for approximately 62% share of the overall market, by revenue in 2017, and is expected to witness healthy growth over the forecast period, at a CAGR of 7.56%. Unlike traditional manufacturing methods, adhesives offer the advantage of flexibility during the production process of automotive components. It has been observed that during new car assessment programs and crash tests, vehicles bonded with adhesives perform better compared to welded vehicles, as they do not affect the substrate used in automobile assembly. Moreover, the recent advancements in the adhesives technologies are aiding automobile manufacturers in the production of lightweight and fuel-efficient vehicles. The PSA market in Asia-Pacific is led by the packaging industry, and it is expected to grow significantly over the forecast period, at a CAGR of 7.65%. The demand for low-cost flexible packaging has been consistently growing in Asia-Pacific, due to a steady rise in food exports and growth in the food-processing sector. In addition, lifestyle changes, workplace habits, and shifting preference toward modern food habits are increasing the demand for packaged food. 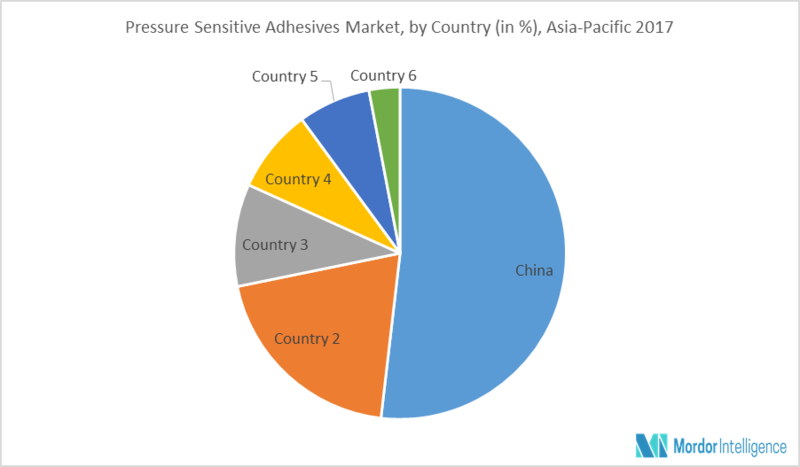 The Chinese pressure-sensitive adhesive market is witnessing strong demand from numerous international industries involved in the automotive and electronics sectors. Similarly, high domestic demand for PSA is experienced from the food & beverage and hygienic product industries, due to the huge population of the country. The packaging industry accounted for the maximum share, over 38%, of the pressure-sensitive adhesives market in 2016. The packaging market in China is expected to grow during the forecast period, driven by the steady growth in the consumer goods market, including packaged food, beverages, home care, and beauty and personal care, supported by the rising household income. January 2017: H.B. Fuller Company announced the purchase of the industrial adhesives business of Wisdom Worldwide Adhesives, a provider of adhesives for the packaging, paper converting, and assembly markets. Major Players: 3M, Adhesive Technologies Inc., Ashland Inc., Avery Dennison Corp., Bostik SA, Buhnen, among others. 8.13 Illinois Tool Works Inc.
8.16 Mapei Malaysia Sdn. Bhd.